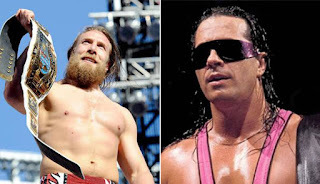 Bret Hart retired some years ago and despite a return in the WWE back in 2010 and two in ring appearances in matches, Bret is done completely. He has had classic matches with just about everybody from his era, but what about wrestlers not of his era? Similar to our Shawn Michaels dream matches list, here are our top 5 Bret Hart Dream Matches against WWE stars he's never faced, past and present. 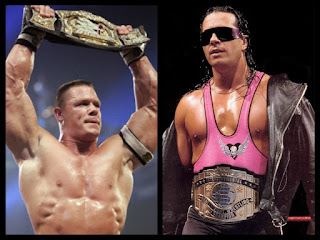 -Canada's all time favorite son against the Canadian that has taken the wrestling world by storm. Owens is the best heel today in wrestling and his demeanor against the heroic essence of Bret would be absolutely amazing. The feud would be great, but on a big match stage? This would have been classic. Bret in his prime versus Owens in his prime? 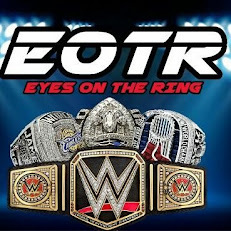 Hey Meltzer, get your 5 stars ready. -I know, I know. Why Cena? Well their characters are similar in some ways, but Bret was a bit more loved universally and decided to turn heel when he got stale, unlike Cena. However, Cena as the Never Give Up general against Bret circa 94 perhaps would be great. The feud would be nice and the match itself would likely be pretty damn good as well, as Bret could definitely lead them to a 20 minute classic. -This match would likely have been the best on the entire list. Bryan was one of the best wrestlers ever, and Bret of course is one of the greatest without a doubt. This match going 26 minutes or so, with near falls and a ton of submissions would be something special to witness. A shame we'll never get to see it. -This is the one I wish I could have seen the most honestly. The dichotomy between these two would have been amazing to observe and experience. The promos would have been interesting and Punk could push Bret to the limit on the mic and the intensity between the two would have been off the charts. We saw them interact in 2012, it would have been amazing to see it again. -This is always the one. The match that would likely have ended up as the greatest match of all time. Give them an hour. Make it Ironman. 2 out of 3 Falls. Make it a submission match. Either way, it would have been a great match and likely one of the best I'd have ever seen. Angle and Bret would have had good chemistry I suspect and with ample time, their match would have been something epic. Any matches that you think are missing? Post them in the comments below.